I am going through my pics and posting swatches that I did sometime last year. 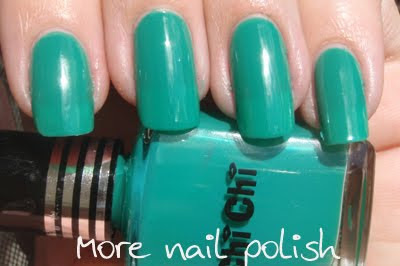 This was a new polish brand for me, Chi Chi. I bought this from Target and they have an ok range of colours. I old bought this one because it was a colour I didn't have. It's called Punk Off. This was three coats, with no top coat. The formula was good, but a little too sheer. You can see a slight nail line after three coats. I was hoping to be able to konad with this, but it's just too sheer for it to work. Would be a nice base coat though. I still love the colour! Great colour and swatch, I have some Chi Chi polishes from around 5 years ago and I've never know why I haven't bought more as back then the colours were quite unique and the formula was perfect. I like the colour. How durable is the polish? I love teals like this one! Thanks gals - from what I recall the wear of this polish was solid. It didn't chip, just wore back from the tips after a few days. I love teals like this too. Perfect for when I can decide whether to wear blue or green.